Lutheran Bishop Munib Younan will participate in an inter-religious service of prayer for peace at the Vatican on Pentecost Sunday at which Israeli President Shimon Peres and his Palestinian counterpart Mahmoud Abbas will be present. Younan is a Palestinian who is president of the Lutheran World Federation and has asked Lutheran and other faith communities around the world to join in praying for peace. "We Christians have the power of prayer. Prayer will change us - it will not change the mind of God, which is the mind of peace - but it will change us and change the minds of our leaders," says Younan in his prayer. "It will show our leaders that our people in both Palestine and Israel don't want any more hatred, they don't want any more violence, they don't want any more separation, they don't want any more occupation, they don't want any more bloodshed. "They want to live with their children and grandchildren lives of peace with justice." The Pope had invited the Abbas and Peres to his home on June 8 for "heartfelt prayer" for peace during his three-day trip to the Holy Land. "I offer my home in the Vatican as a place for this encounter of prayer ... to join me in heartfelt prayer to God for the gift of peace," said Francis. "Building peace is difficult, but living without peace is a constant torment." L'Osservatore Romano reported that the office of the Israeli president announced that Shimon Peres welcomed Pope Francis' invitation to the Vatican, noting that he "has supported and will continue to support all avenues to bring about peace." It said that Abbas also accepted the invitation, according to his spokesperson, Nabil Abu Rdeneh. 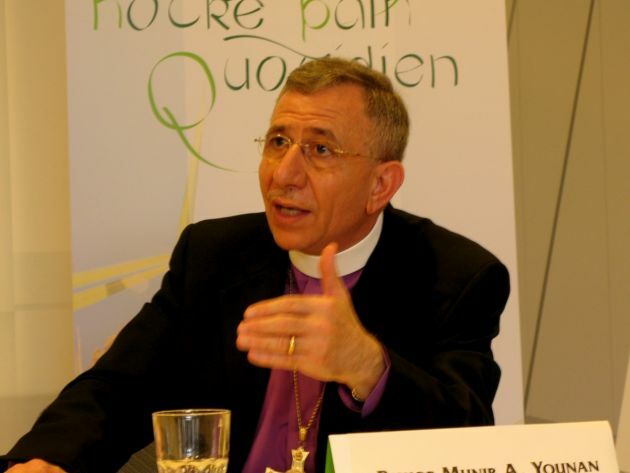 Younan is the presiding bishop of the Evangelical Lutheran Church in Jordan and the Holy Land, a member church of the World Council of Churches. The WCC represents 560 million Anglican, Orthodox and Protestant Christians. The Roman Catholic Church is not a member of the WCC but it is a member of its faith and order commission and cooperates with the council in many areas.